Learn here how to fill the Lexmark #42A cartridge with the process that is described here. The Lexmark #42Acartridge is a cartridge with which we can get about 700 pages after filling, for this we recommend following the procedure presented below. First of all it is important to clarify that the priority is to supply the ink as slowly as possible and that this cartridge can only get about 15ml of ink. Study the procedure to fill the black cartridge Lexmark #42A. Something we need to have always in mind is the ink we work with to fill the cartridges is difficult to remove from both hands and clothes, we have to put our cartridges in a place where it is easy to remove the ink spill, for this we recommend a smooth and easy to clean surface or a piece of black cloth. To fill the black ink cartridge we need a 15ml syringe, and before putting the ink into the cartridge we have to verify that it has no air. It is necessary to remove the tape from the cartridge top, this is the one that contains the cartridge information such as color and cartridge number, while filling the black cartridge put this tape in a place where the glue is not damaged as we have to reuse it to prevent damage. Remember to supply the ink slowly so that it fills the entire sponge that these cartridges have inside. 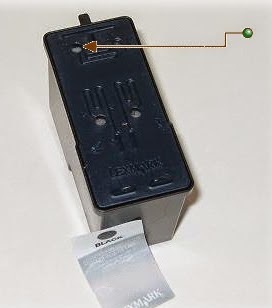 When the cartridge is filled completely put back the label, put it as it was at first, places the label really hard that it makes the function for which it is in the ink cartridge. You may be interested on tips for caring your ink cartridges. let stand the cartridge after refilling at least an hour, try to put it away of anything that can touch the ink nozzle, if this one is touched for example with a napkin it will pour all the ink, make at least three cleaning processes with your printer if it is necessary, and if possible make an impression in black completely to verify the quality of the prints. Try to read how to uncovering a cartridge in my house. Some of these cartridges when we fill it they do not work, check if this cartridge into the top has a label that said "return program", if so these cartridges are impossible to refill. Verify which other cartridge is compatible with your printer.